Giant Lantern. Hong Kong. Courtesy of Hong Kong Tourist Board. Many China-related cultures consider the September full moon the most beautiful of the year. This year, it’s on September 12. It is a time for separated lovers to gaze at the moon, knowing their partners are doing the same. It is a special, romantic event. Many weddings take place during this time. It is also known as the harvest moon, because the full moon enables farmers to work longer to harvest their crops. In China, this moon is marked with a festival. Families traditionally make or buy lanterns, take a picnic, and spend the evening enjoying the moon. 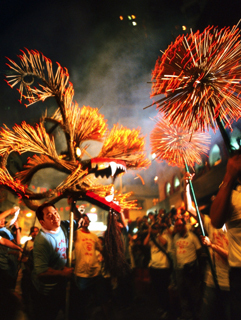 Hong Kong currently celebrates it for ten days from Sept. 3 to 13. 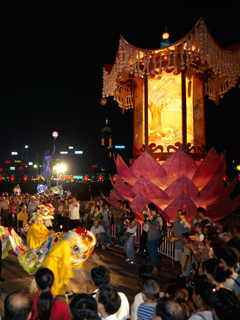 The highlight this year is the “Lee Kum Kee Lantern Wonderland” in Victoria Park, There’s also the legendary Tai Hang Fire Dragon Dance, recently inscribed onto China’s national list of intangible cultural heritages. It is a very important festival there. Central to the festival also is the making and distribution of gifts of moon cakes. You will see these in bake shops and grocery stores in Toronto’s Chinese communities too. The best cakes are those baked with unbroken salted egg yolks inside. These represent full moons. During the Yuan dynasty, China was ruled by foreigners. Rebels were intent on overthrowing these Mongols. They hid secret messages, about the times and places of their attacks, inside the cakes. Fire Dragon. Hong Kong. Courtesy of Hong Kong Tourism Board. All of these cakes are so rich that few people actually eat them. They are made of lotus seed, red bean or mung bean paste. When I lived in Hong Kong or visited China during this festival, I discovered that people gave moon cakes as gifts to friends who then re-gifted them to other friends or business colleagues. No one wanted to eat more than one small piece. With their high percentage of fat, there are too many calories. But the tradition lives on. Toronto’s celebrations will be modest compared to Hong Kong’s. Several Vietnamese groups are organizing a celebration at Harbourfront on Saturday, September 17 from 1 to 8pm. Tet Trung Thu: Mid-Autumn Festival will have special foods, crafts, music, and dances featuring local Vietnamese performers. The Greater Toronto Chinese Cultural Centre has invited the public to its celebration from 1 to 3pm on Sunday, September 11. It offers free tea and moon cake, performances and crafts. It’s in Scarborough. Everyone is welcome. Tel. 416-292-9293. 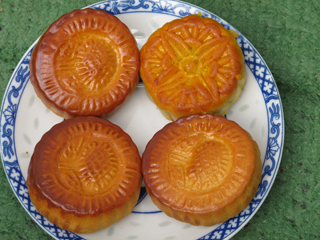 Moon Cakes. Image©Ruth Lor Malloy 2011. On Saturday, September 10, the Toronto Public Library, Riverdale Branch, will celebrate the Moon Festival with a program from 2-3pm. It is aimed at children. Expect a taste of moon cake, along with stories and crafts. 370 Broadview Ave. Tel. 416-393-7720. See also No. 178, Sept. 9 to 11 Weekend. For more details, please see: www.TorontoMulticulturalCalendar.com. Please find some sky and enjoy this moon. In 2017, among others, a Filipino-Chinese group is celebrating the Moon Festival. See: https://www.torontomulticulturalcalendar.com/2017/09/14/784-september-16-28-affordable-events-in-multicultural-toronto-2017/. More information in our October blogs to be published early October in https://www.torontomulticulturalcalendar.com.